When you bake a cake and use a cake mix, but doctor it up, people think you’re a genius! What if you do the same with boxed potatoes? Stay with me a minute. Don’t you want a recipe that makes the dinnertime a little easier? 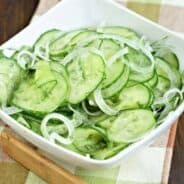 Less mess in your kitchen? Less prep work? I know you do. 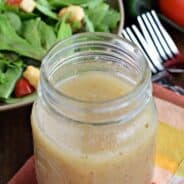 A recipe that tastes amazing and is delicious enough to serve to guests? Well, then stay a while and read more! 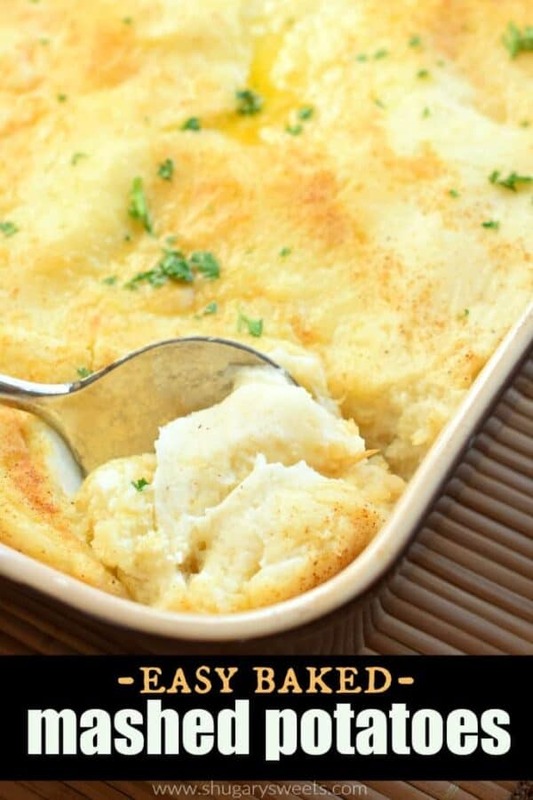 These Baked Mashed Potatoes are my family’s favorite. My kids actually prefer these over fresh potatoes (and to be honest, so do I). They are packed with flavor, thick enough to withstand your heartiest of gravies…yet they have a creamy flavor and can stand on their own plain! Start with a box of Instant Mashed Potatoes. Follow the directions to make 12 servings. This is enough for a 13×9 baking dish. If you want to half the recipe or double the recipe, just adjust the ingredients, not the baking time below. One note on making the instant potatoes. Make them a little thicker than normal. I usually pour in some extra flakes to make them thick, stirring as I add extra potatoes. Next, add sour cream, cream cheese, salt and pepper, and paprika to your potatoes. Stir until smooth and cream cheese is melted. One trick is to cube your cream cheese before adding it to the hot potatoes, as the smaller chunks melt quicker. Or soften your cream cheese first. 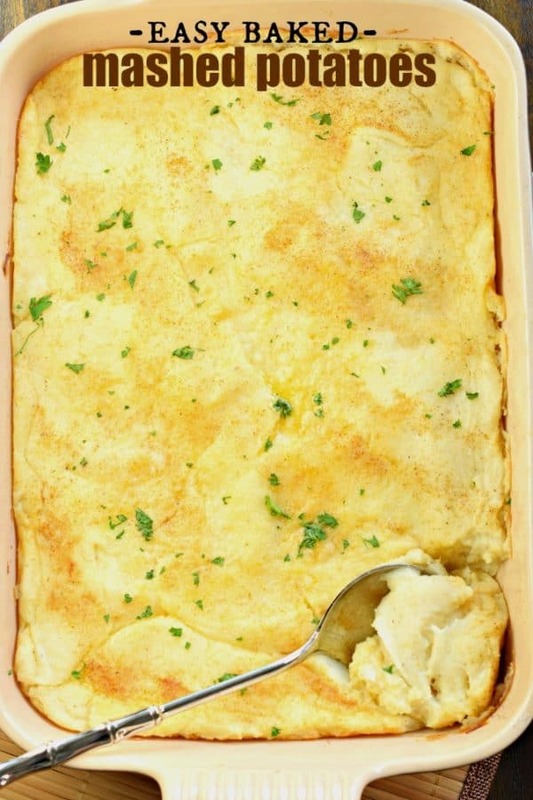 Once blended smooth, pour potatoes into a buttered 13 x 9 baking dish. 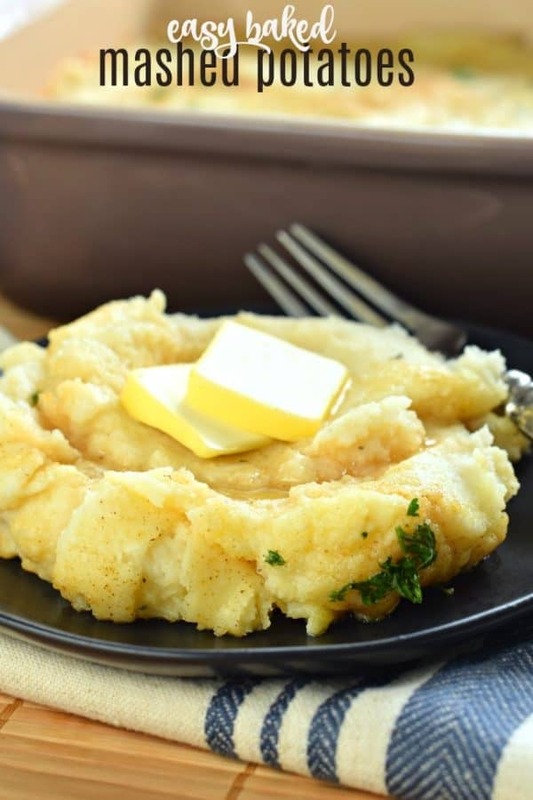 Slice 1/4 cup unsalted butter and place thin slices over the top of the potatoes. Sprinkle with a few pinches of paprika. Bake uncovered in preheated oven for 30-40 minutes, until bubbly and browned on edges. Serve immediately. Yes. One of the best parts of this dish, is that you can prep it the day before. Cover with foil and refrigerate. Then, bake accordingly when ready to serve, adding an extra 5-10 minutes if it’s coming cold from the refrigerator. 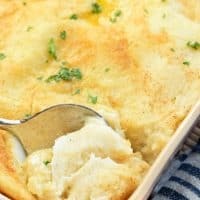 A few years ago I shared my mother in law’s recipe for mashed potatoes. We call them Jill’s Cheating Potatoes. If you’re looking to load them up today, you’ll need shredded cheddar cheese, bacon crumbles, and green onion. Add these ingredients to the top of your prepped mashed potato casserole and bake according to the directions below. I usually make them loaded when my older kids are home for the holidays! Okay. I know some of you will ask. 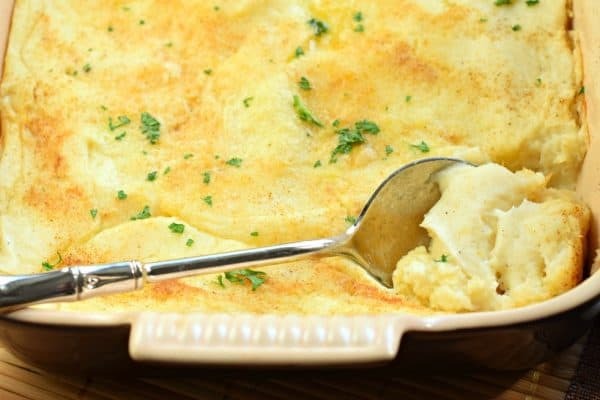 How do I make this if I don’t want to use instant potatoes. Easy. Add your washed, peeled potatoes to a large pot covered with water. I would say about 12 potatoes, depending on size. 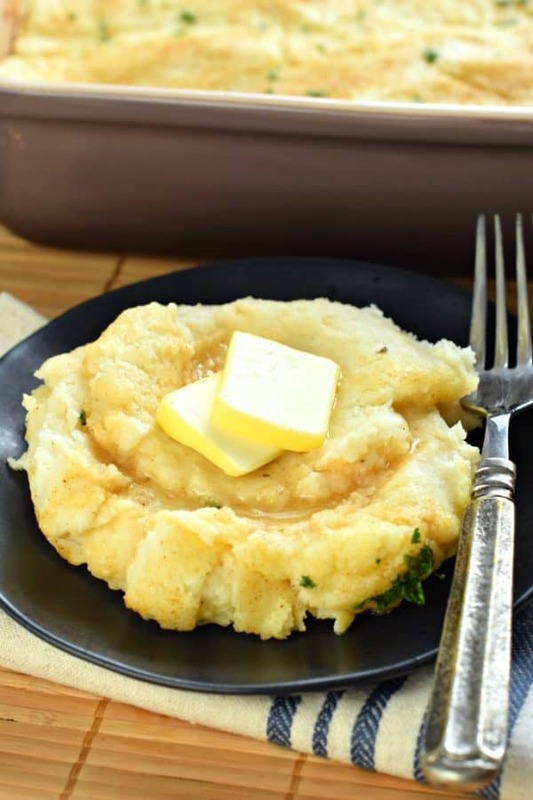 You’ll want about 6 cups of mashed potatoes (each medium potato usually yields 1/2 cup of mashed potatoes. Bring to a boil over high heat. Once boiling, cook until tender. Drain the water and mash the potatoes (I like to use my mixer to get them extra creamy and smooth). Then follow the directions above using the mashed potatoes for the instant potatoes. These potatoes as I said above are hearty enough to withstand your favorite gravy. But they are delicious enough to enjoy as a side dish all on their own. One of my favorite dinners, this Balsamic Roast is delicious paired with today’s potato recipe. Slow Cooker Balsamic Shredded Beef is perfect when you crave comfort food but don’t want to turn on the oven! Tender, flavorful Classic Meatloaf recipe with a sweet and tangy bbq glaze. This Perfect Meatloaf is better than you remember, give it a try tonight and serve it with today’s potatoes! No gravy needed. Today’s potatoes go perfect with this Authentic Swedish Meatballs recipe. It’s delicious enough for a weeknight meal, and impressive enough for guests! You’ll love the creamy sauce and the sides of cucumbers and lingonberries! With only a few minutes prep time, you can have this Slow Cooker Balsamic Chicken for dinner tonight! Pull out your crockpot, fix it and forget it! 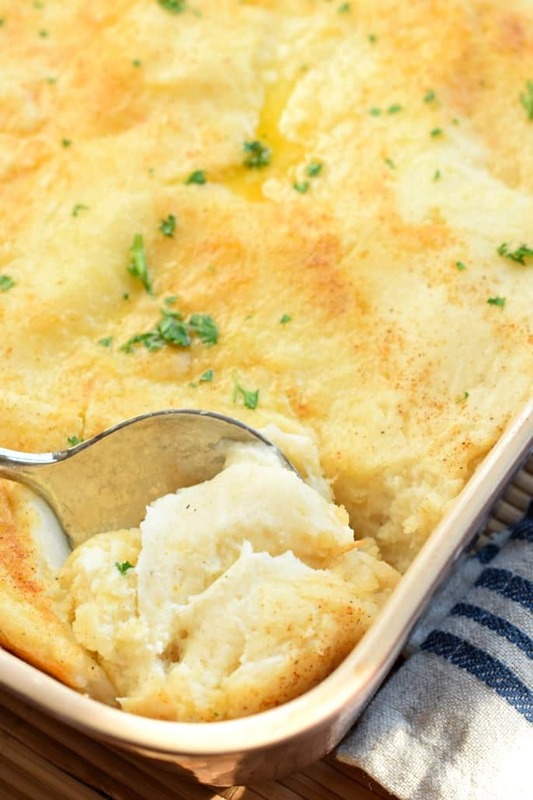 Oven Baked Mashed Potatoes are creamy, delicious, and easy to assemble ahead of time. But, don't tell anyone, I've got the secret on how to make them with instant potatoes! Prepare instant potatoes according to package directions. Make them thicker than normal by adding in some extra flakes. Once prepared, blend in sour cream, cream cheese, salt, pepper, and paprika. Pour into a buttered 13 x 9 baking dish. Sprinkle the top with a little pinch of paprika and place slices of butter over the top. Bake for 30-40 minutes. ENJOY. To make ahead of time, before baking, cover with foil and refrigerate for up to 24 hours. Remove from refrigerator and bake for 40-50 minutes uncovered. ENJOY. To use fresh potatoes, you'll need 6 cups of mashed, about 10-12 potatoes, peeled. YUM THESE WERE DELICIOUS! THANK YOU! This is seriously making me hungry! This looks totally awesome! 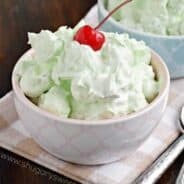 Love that these can be made ahead of time! So easy and delicious! This is so great for when company is coming over. Pinning!